From traffic to the various website categories, there are a lot of factors that change what the market share and distribution of e-commerce platforms are. For instance, the market share of platforms varies greatly when you filter between the top 10K, 100K, and 100M sites. 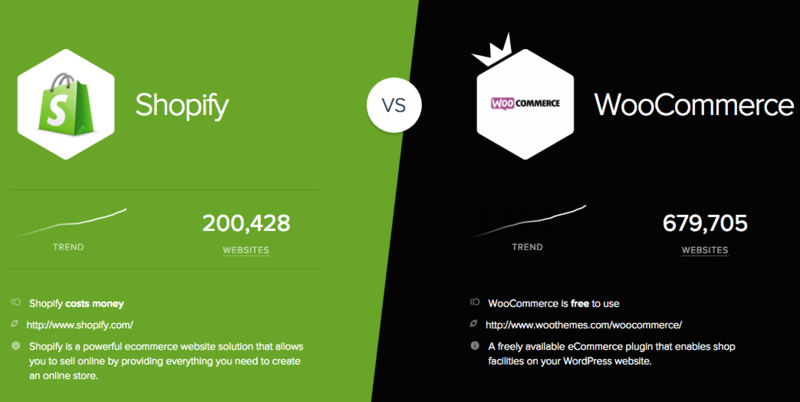 The variation of market share shifts a great deal depending on the websites you are looking at. Starting from the top 10K sites you can see that a big name like Shopify isn't even on the top 9 in terms of market share and IBM is the predominant platform. 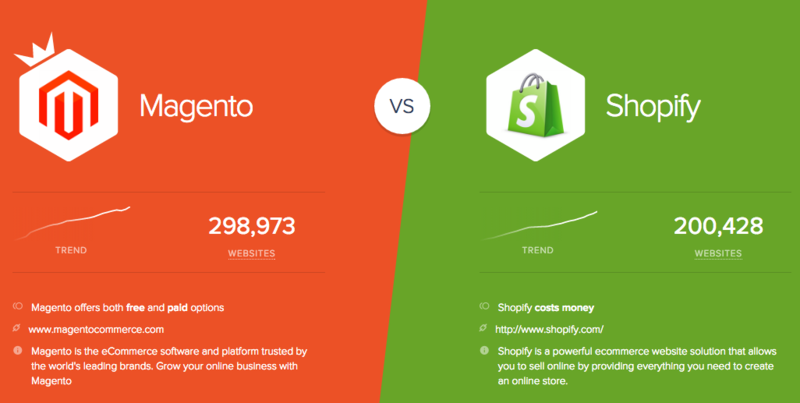 Magento is in firm control of the top 100K and 1M sites which is why it is amongst the biggest names in eCommerce platforms. The reasons behind the changes in market share depending on the sites you are looking boils down to a few elements, but none more important than resources. The sites you find in the top 10K are websites like Zulily.com who gets 34.4M monthly visits requires a specific eCommerce solution that is very resource intensive, in this case that platform is Magento. Magento can meet Zulily's needs in terms of the scale of services it is able to provide but this also means a large amount of resources have to be allocated to the complex workings of the platform. You can see that the websites that use Magento are generally high ranking websites that deal with a great deal of traffic, thus have quite specific needs. On the other end you have a website like dailysteals.com whose monthly visits are 1.55M, which pales in comparison to zulily's even though they are both shopping websites. 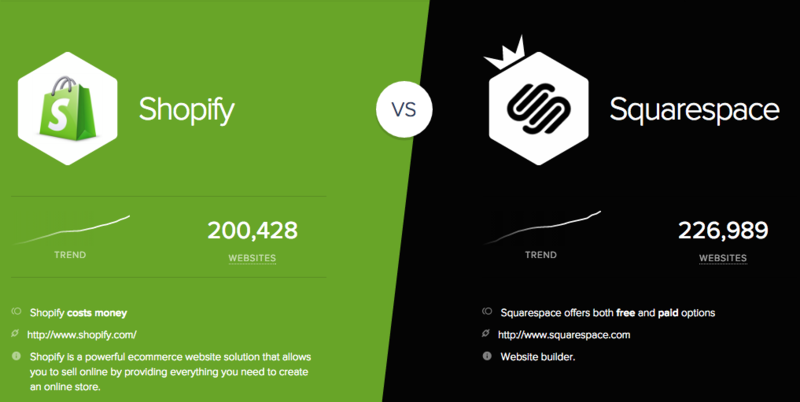 Their monthly visits reflect the eCommerce platform they use, Shopify. 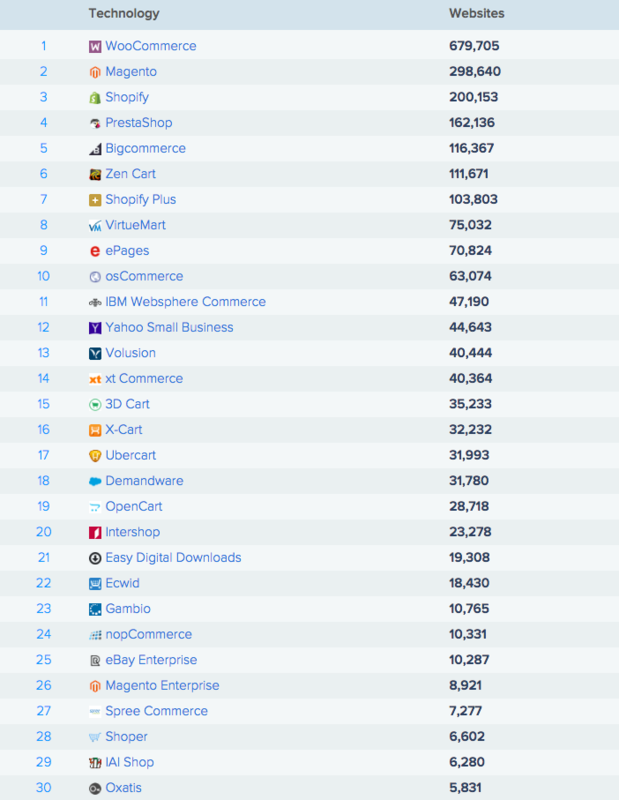 Although Shopify has become quite scalable they are still seen as a solution for more "mom and pop" sort of business'. This means Shopify requires much less resources in order to function properly. With larger functionality comes larger complexity. 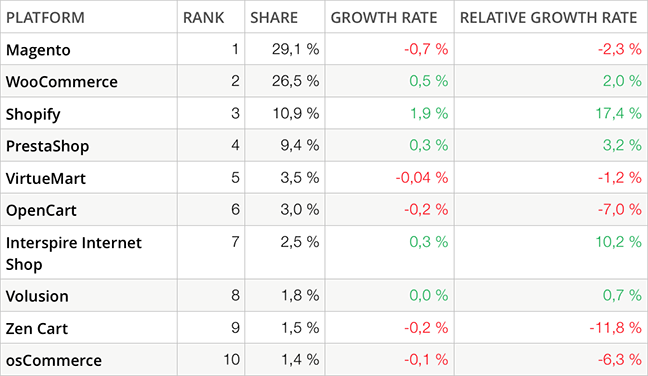 Market share as a whole is an obvious direct reflection on the success of a given platform, but looking at the growth rates and trends you can see why there have been recent changes in the rankings. 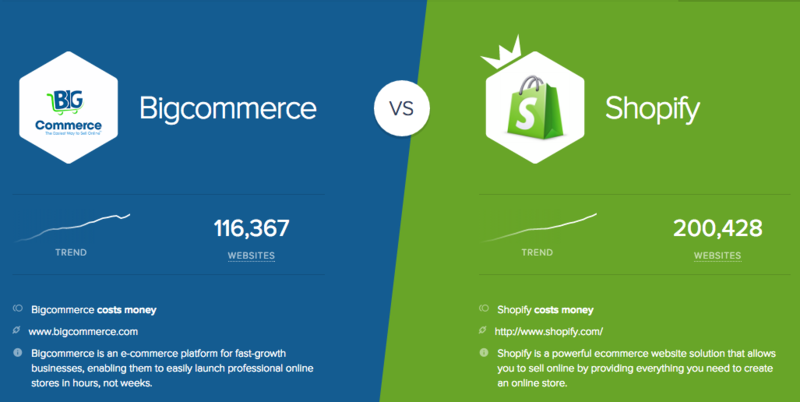 For instance Shopify has recently overtaken PrestaShop to join the illustrious top 3 with its phenomenal 17.4% of relative growth. Consumers are not only looking for scalable, easy to use, and affordable solutions for their eCommerce needs but also compatibility. For instance, Ecwid's shopping cart is distributed as a plugin for popular CMS, including WordPress, WordPress has a great affect on the use of different e-platforms such as WooCommerce, WP E-Commerce, and now Ecwid. [Check WordPress market analysis]. "We chose Magento as our preferred Ecommerce platform primarily because it's a highly feature rich, scalable and has hundreds of extensions allowing us to compete with the larger online retailers in the UK market"